In the 1990s, a terrorism risk assessment conducted by the General Accounting Office (GAO) led to preparedness recommendations for United States municipalities. By May 1998, GAO reported, only 11 cities had put in place the necessary emergency response systems. Intelligence based terrorism threat and risk assessments gained much greater import after the terrorist attacks of September 11, 2001, but the U.S. intelligence community often found itself in the challenging situation of recommending public warnings without inciting panic or alternately, complacence. In 1996, Congress passed legislation whereby law enforcement and emergency response personnel in 120 of the largest cities nationwide were required to undertake training in order to become prepared for the possibility of a terrorist attack. To assist in these preparations, Washington appropriated $30 million in training funds. Yet, according to an April 1998 GAO report, Combating Terrorism: Threat and Risk Assessments Can Help Prioritize and Target Program Investments, fewer than a dozen cities had undergone the necessary training. Figures provided by two House members showed that, in fact, 22 cities had completed this training, but in any case, only about one in six of America's major cities was prepared. According to GAO's report, "While it is not possible to reduce risk to all potential targets against… terrorism, risk assessments can help ensure that training, equipment, and other safeguards are justified and implemented based on threat, the vulnerability of the asset to an attack, and the importance of the asset." The Department of Defense (DOD), placed in charged of the preparedness project, questioned the need for risk assessments, which DOD officials claimed would raise implementation costs by as much as $30,000 per city. According to DOD representatives, risk assessments would not affect a city's choice of preparedness equipment. In December 1998, four months after the Islamic terror network al-Qaeda bombed two U.S. embassies in Africa, U.S. intelligence learned of plans for another attack orchestrated by al Qaeda leader Osama bin Laden. The New York Times reported the advisory, but the end of the year passed without incident. A year later, intelligence sources warned of an attack to occur on December 31, 1999, and although U.S. authorities apprehended suspected al-Qaeda operatives, the story gained little attention in the U.S. media. This time, Americans were more concerned about the apparent Year 2000 problem, or computer glitches associated with the transition from 1999 to 2000. 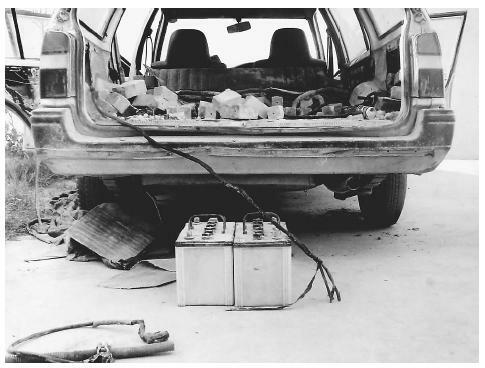 Explosive materials and electric igniting devices are shown in the car of a suicide bomber just 300 yards from the U.S. Emabssy in Kabul, Afghanistan, where he was stopped by a chance traffic accident in July 2002.
of determining how much to tell the American people so as to keep them properly informed but not spark mass hysteria—and not give away too much information concerning the intelligence resources used in making the threat assessment. Fortunately, the threat passed, but the issue of how to handle suspected threats has not been resolved. When the Office of Homeland Security suggested in February 2003 that Americans purchase duct tape and plastic sheeting to guard their homes against a possible chemical attack, the announcement was greeted with more derision than panic. The idea of risk assessments dates back to the early Cold War, when intelligence agencies on both sides of the iron curtain were concerned with sizing up one another's relative nuclear and conventional weapons and capabilities. With the end of the Cold War and the rise of international terrorist groups as America's principal foe, risk and threat assessment has become much more challenging. Some experts in the field use the term "net assessment," referring to a complex of factors that includes both the actual threats and the perception of those threats. Integral to such risk assessments, then, is some quantifiable determination of the psychological state both of the terrorists and the threatened population. Cameron, Gavin. Nuclear Terrorism: A Threat Assessment for the 21st Century. New York: St. Martin's Press, 1999. Cordesman, Anthony H. Terrorism, Asymmetric Warfare, and Weapons of Mass Destruction: Defending the U.S. Homeland. Westport, CT: Praeger, 2002. Haugen, David M. Biological and Chemical Weapons. San Diego: Greenhaven Press, 2001. Roukis, George S., and Hugh Conway. Global Corporate Intelligence: Opportunities, Technologies, and Threats in the 1990s. New York: Quorum Books, 1990. Burns, Jimmy. "Assessing Terror Threat Raises Whitehall Tension." Financial Times. (December 14, 2002): 5. Cummings, Jeanne, and Gary Fields. "Calculating Risks: For Two Tense Days, Bush Team Wrestled with Vague Threat." Wall Street Journal. (May 17, 2002): A1. Summary/Review of Reports Concerning Threats by Osama Bin Laden. Cornell University Library. < http://www.library.cornell.edu/colldev/mideast/bladen98.htm > (April 7, 2003).